Katie Bouman, 29, led development of a computer programme that made the breakthrough image possible. For Ms Bouman, its creation was the realisation of an endeavour previously thought impossible. Excitedly bracing herself for the groundbreaking moment, Ms Bouman was pictured loading the image on her laptop. 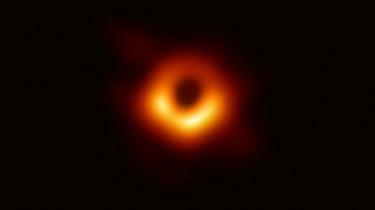 “Watching in disbelief as the first image I ever made of a black hole was in the process of being reconstructed,” she wrote in the caption to the Facebook post. There, she led the project, assisted by a team from MIT’s Computer Science and Artificial Intelligence Laboratory, the Harvard-Smithsonian Center for Astrophysics and the MIT Haystack Observatory. The black hole image, captured by the Event Horizon Telescope (EHT) – a network of eight linked telescopes – was rendered by Ms Bouman’s algorithm. In the hours after the photo’s momentous release, Ms Bouman became an international sensation, with her name trending on Twitter. In a tweet, New York Democratic Rep Alexandria Ocasio-Cortez wrote that Ms Bouman should take her “rightful seat in history”. “Congratulations and thank you for your enormous contribution to the advancements of science and mankind,” she tweeted. “Here’s to #WomenInSTEM!,” which stands for science, technology, engineering and mathematics. Ms Bouman was also hailed by MIT and the Smithsonian on social media. But Ms Bouman, now an assistant professor of computing and mathematical sciences at the California Institute of Technology, insisted the team that helped her deserves equal credit. ← #European Union leaders have granted the UK a six-month extension to Brexit, after five hours of talks in Brussels.